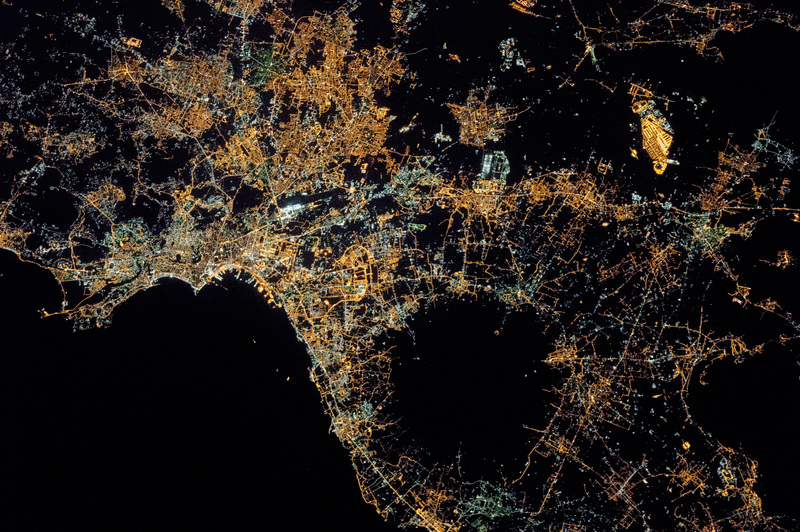 An astronaut aboard the International Space Station took this photograph of the city lights of Naples and the Campania region of southern Italy. 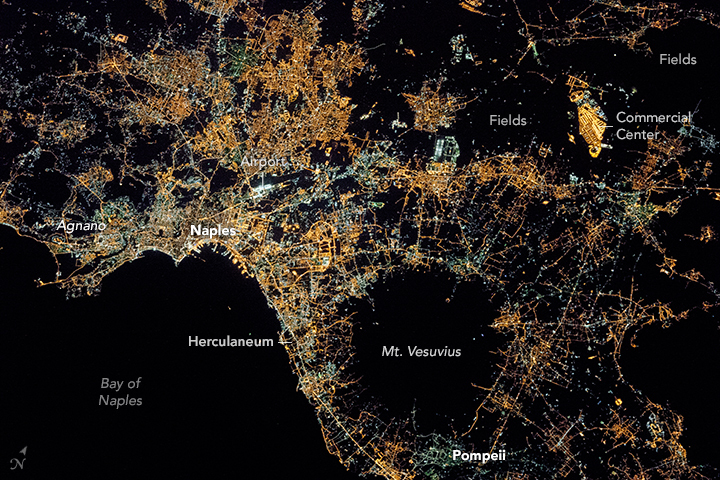 A regional view of Italy from 2014 shows the Naples region to be one of the brightest in the country. Roughly three million people live in and around this metropolitan area. The different colors of lights in the scene reflect some of the history of development in the area. The green lights are mercury vapor bulbs, an older variety that has been replaced in newer developments by orange sodium bulbs (yellow-orange). 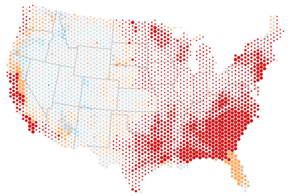 To the northeast, the lightless gaps between the homes and businesses are agricultural fields. The bright yellow-orange complex amidst the fields is the CIS emporium, the largest commercial retail facility in Europe. 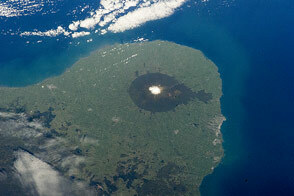 The large black circular area in the photo is Mount Vesuvius, the only active volcano on Europe’s mainland. Vesuvius is a stratovolcano, made up of different materials—pyroclastic flows, lava flows, and debris from lahars—that accumulated to form the volcanic cone. Although any volcanic materials can endanger surrounding communities, pyroclastic flows of superheated ash and gas are among the most dangerous, moving at speeds of hundreds of kilometers per hour. The cities of Pompeii and Herculaneum were destroyed in 79 AD by pyroclastic flows, which trapped more than 16,000 people. Such historic catastrophes—and the fact that 600,000 people live in the immediate vicinity—are the reason the volcano is one of the most heavily monitored in the world, with several dozen sensors located at many points on and around the cone. By dating lavas, scientists know that Mount Vesuvius has had eight major eruptions in the past 17,000 years. Vesuvius is part of the Campanian Volcanic Arc which includes the Campi Flegrei caldera/geothermal field to the west of Naples near Agnano and Mount Etna in Sicily. Astronaut photograph ISS050-E-37024 was acquired on January 30, 2017, with a Nikon D4 digital camera using a 400 millimeter lens, and is provided by the ISS Crew Earth Observations Facility and the Earth Science and Remote Sensing Unit, Johnson Space Center. The image was taken by a member of the Expedition 50 crew. The image has been cropped and enhanced to improve contrast, and lens artifacts have been removed. The International Space Station Program supports the laboratory as part of the ISS National Lab to help astronauts take pictures of Earth that will be of the greatest value to scientists and the public, and to make those images freely available on the Internet. Additional images taken by astronauts and cosmonauts can be viewed at the NASA/JSC Gateway to Astronaut Photography of Earth. Caption by Andi Hollier, Hx5, JETS Contract at NASA-JSC. Millennia of human development stand alongside mainland Europe’s only active volcano.